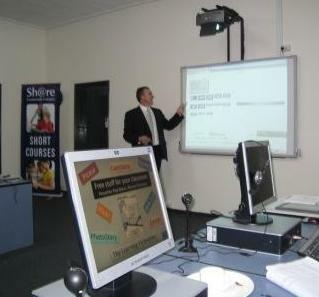 Last week I went to the first of two Pearson FreeWeb PD sessions with Paul Mears. I learned some new tricks with FlickrStorm beginning with loading up my own set of Images of England. At home I had a further play and created a set of coral reef pictures that I can use next time I do this unit of work with the Juniors. The workshop was especially useful because Flickr doesn’t seem to have a link to FlickrStorm so you’d never find it if not told about it, and also FlickrStorm isn’t very intuitive. It has a minimalist interface and rather unobtrusive icons! After that, we played with Picasa. I already have a Picasa album (see the blogroll at right) but Picasa 3 has new features, and I learned how to upload from images to album direct. However, what I really liked was learning how to manage those pesky folders, because previously Picasa would scan everything – including every little picture in every little program I had – which was very annoying. To select which folders you want it to browse, go to the Tools Menu, and then select Folder Manager. I explored further at home and discovered that it will even automatically add the photos to Blogger, which will be nice next time I have travel photos for my Travels with Tim and Lisa blog. Alas it doesn’t work for uploading photos to WordPress which is what I use for my professional blog, nor for Global Teacher or Edublogs… Paul also showed us to make a Gift CD which is really nice for Prep teachers and at home I tried out making a collage, of my dogs, naturally. 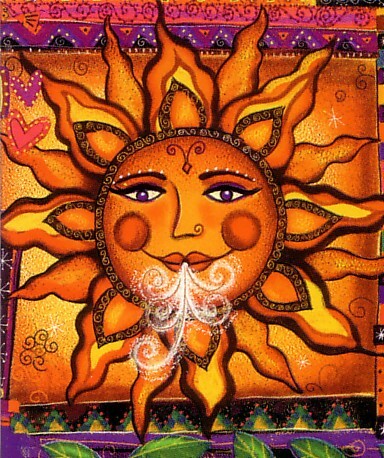 We had a very quick look at Rubistar – which is a beaut site for rubric making. Last time I looked at it (which is a while ago) it was rather primitive, with lots of awful rubrics for American projects that seemed fearfully dull and rather fuddy-duddy compared to the tasks we set using DATT tools and other graphic organisers. But now it is much more flexible and even has a drop down menu. Having just finished doing term 4 projects with about 360 kids from Year 1 to year 6 I’m just a little bit tired of them LOL, so I shall leave exploring more of Rubistar till next year. Our final task was to create a PhotoStory. This is another free program you can download. By coincidence I had just learned how to do one of these at the weekend, but as always with ICT there was more to learn. The first trick is to use Picasa to get your photos. You can insert up to 200 photos; if you want more, make two photostories, then combine them using Moviemaker (another program I am just learning to use). The next trick is to ignore that ‘test your microphone icon’ which was what mucked up the narration I tried to do at the weekend. The other crucial distinction I learned was that you must always save the project so that it can be opened and edited; save the finished movie as a file name (use the prompt in the middle of the menu i.e. as a wav file) because it can’t be edited. So before finalising the movie, always save it as a project. Make sure that students understand the distinction and use proper file saving skills especially naming. You can even write a shared digital story by getting students to create the text & narrations for 1-2 slides and then put it together using MovieMaker. Paul showed us one that he had done, and it did look impressive, especially if you burn it onto a CD and let the kids take it home. It was a fabulous workshop, even if I did have to drive through a hailstorm to get there. We were given a CD with further resources including a most intriguing program called Scratch, the purpose of which I don’t really understand yet. I shall have a play with that in due course…. I discovered David O’Reilly’s Australian Explorers website. This is a beaut site, which features kid-friendly summaries of the exploits of major Australian explorers. Alas, the congratulatory feedback I sent to the site bounced back to me; I hope he’s still developing resources like this somewhere on the web! If you’re a teacher-librarian, a lover of books or anyone interested in Web 2.0 and the amazing resources it has to offer, then you really should subscribe to the SLAV Bright Ideas blog. It is through this blog, for instance, that I discovered the Google LitTrip site, and it is such fun! It’s the old literary journey idea, i.e. making a map of journeys taken by characters in a novel, updated for the 21st century, using Google Earth. If you haven’t already downloaded this to stickybeak at your neighbour’s backyard LOL, then you need to do that first before you can play with LitTrip. Try it out with The Kite Runner. You’ll find it on the downloads page, and seeing the landscape that the characters travelled through will change the way you remember this book forever. The first of the concurrent sessions I went to was a presentation by Jan Letta. Jan is a wildlife photographer who has made it her life’s work to photograph endangered animals in their natural habitat and bring their stories to life for children. 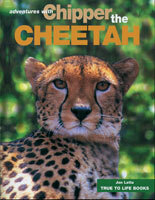 She has produced some very fine little books about lions, cheetahs, tigers and so on, in a series called True to Life Books – each with simple text that makes them perfect for beginner readers. The ABC persuaded her to document her adventures in Africa, India and China in a magnificent hardcover book, Diary of a Wildlife Photographer but what I found interesting was Jan’s explanation about the economics of publishing books like hers. The cost of including full-colour photographs is prohibitive for the educational publishing market, but she is able to produce them at a reasonable price because she designs and publishes them herself, selling them at school visits and on the internet. Another example of cottage industry thriving on the web! After lunch there was a most interesting presentation by Gabrielle Wang, author of The Garden of Empress Cassia, The Pearl of Tiger Bay, and the forthcoming A Ghost in My Suitcase. 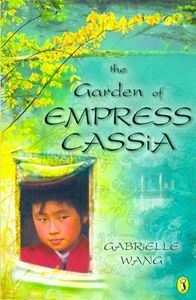 Gabrielle is of Chinese descent, and her fiction explores belonging and shared cultures. I liked what she had to say about imagination – our culture tends to disparage it, but everything man-made that we see was once imagination. Reading is an act of imagination that should be cherished. In the second concurrent session, I heard Jane Godwin’s talk: Publishing and Writing: How These Worlds Connect. There were lots of auditory distractions in the Function Space – the clinking of crockery in the cafe, and very noisy contruction work outside. It seems odd that a space like this in an award winning design like Federation Square couldn’t be closed off properly to reduce the noise. Did the architects and designers really think that curtains would achieve this? Anyway, Jane soldiered on, and I liked what she had to say. She’s not a fan of what she called ‘heavy-handed social issue picture books’ and I certainly agree. She says that even though they are well-intentioned, such books are cruel to little children, because they’re a lesson not a story. Good literature is not didactic. If we want to explore these issues we should use fairy tales because they are removed from the child’s real world. She believes that young people don’t understand hindsight, and therefore although horrors can be examined, they should usually be righted. Happy endings are psychologically important for children – and why not? 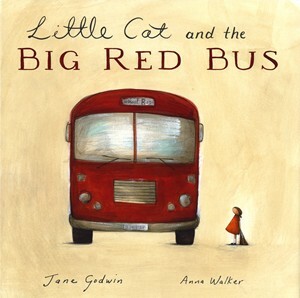 Jane’s work includes Little Cat and the Big Red Bus; The True Story of Mary Who Wanted to Stand on her Head, Millie Starts School, and the young adult novel Falling From Grace. There’s also the non-fiction title When Elephants Lived in the Sea which looks as if it could be useful for the Life on Earth unit that I am currently doing with Year 5 & 6 because it explores evolution. Little Cat and the Big Red Bus is an interesting story, because it features a male bus driver caring for a little one who falls asleep on the school bus. Jane told us that she was asked to change the gender of the driver, but she refused: she wanted to depict the kindness of strangers who care for us when we need it as children, and she wanted to show that men can be good and kind. I think it is a beautiful book, and I think it is very sad that marketers are so paranoid about child abuse that they are spooked by an image of a man carrying a little child to safety. Jane finished up by reminding us of something that Ian McEwan wrote after 9/11: Imagining yourself into the lives of another is the beginning of compassion and morality. It was a most engaging session. After that, I did something really foolish: I went to the wrong session. Instead of going to E-Readers and E-texts which I was really looking forward to, I went by mistake to ACMI 2 and not ACMI 1. It was all about changing the reading culture at a very challenging school in the northern suburbs, but it was not what I wanted to go to! By the time I realised what I’d done, it was too late to barge into the right session so I slithered out of my seat and took an early train home. The SLAV conference was held this year at Federation Square, so I went in on our much maligned train system (punctual, clean and swift) and then had a very nice breakfast at Time Out until it was time to make my way up to ACMI Cinema 2. I am still not entirely convinced that Federation Square is a success for events like these – although the cinema is a much better venue than VIT in terms of being able to see the speaker and all of the screen, it has a strange disembodied feel about it. The lighting is a bit dim for taking notes, and there’s definitely something wrong with the air conditioning. I was not the only one nodding off, and not from boredom! The same thing happened at the Melbourne Writers’ Festival earlier this year, even when some of my favourite writers were on stage. Elsewhere the informal spaces for gathering and chat don’t seem to work at all, and there simply aren’t enough toilets for large numbers of women. Anyway, the theme was Re-imagine Other Worlds, very appropriate for teachers of literature. However, much of the focus was more secondary orientated than last year. Although it was interesting, I often found myself thinking how lucky I am that I don’t have to teach library lessons to unwilling year 8-9 students! The conference began with an introductory address called Setting Literature Free: Story Lines by Linda Gibson-Langford. Linda talked about how boys in secondary school don’t want to listen to stories – they will fidget and disrupt even a really good book like Brisinger. Linda quoted research by Schnog (2008), telling us that if we listen to the ‘voice of the boy’ we will realise that they feel no connection to the library or the world of books, because a library lesson is bounded by print and 19th century ‘good’ literature rather than connecting with contemporary culture. Efforts to create sophisticated teen readers means we often dissect the work and ruin it, alienating the reader. This generation is used to publishing their own ideas any time they like – and we should try to explore their world. Young people today live in a world of choice whether they are consuming, expressing or producing. It’s a world of multimedia, video editing, animation, 3D visualisation and twitter. It’s Facebook and Second Life, and the interactive Web. To engage them, she said, we need to discover their place, realise their privilege and develop their passion with creative ways of enjoying the story together. These ways could include research with digital identities such as avatars to make a game of it, and ‘moving the reading experience sideways’, letting their world converge with reading. This all sounded fine until she gave an example: they’re interested in Spiderman, so bring in a spider and then read Charlotte’s Web. This seems just like gimmickry to me, and I was very surprised by her choice of book. This great classic children’s story suits 8-11 year olds, but I suspect that secondary students would dismiss it as babyish, even if a teacher did jazz it up with Web 2.0 somehow. However, some of her other ideas were more intriguing. Reading aloud on a podcast or Second Life; or facilitating an author visit with Skype and a WebCam sounds fun. Personal reading with Kindles or iPhones might lure some students into the world of literature, and pairing a novel with video games might engage interest too. I use film and cartoons on and off during the year with most of my classes, always focussing on how the book differs – even with Preps when we read and view the Beatrix Potter stories in term 2. For some students, seeing the film is an incentive to borrow the book, but for others it is not. I recognise that some students are never going to become keen readers, and at least they have had some exposure to the great stories of our culture through hearing it and seeing it on film, and they can articulate what the differences are. This week, teachers at my school celebrated their year’s work by collaboratively reviewing their PDPs (Performance and Development Plans). We meet in small groups of peers and informally share our self-assessments prior to meeting with our reviewers – it’s a wonderful way to celebrate achievements with colleagues who know the context of our work, and share the same journey. At the beginning of the year our graduate teachers meet together to chat about their plans, and so do accomplished teachers, expert teachers and leading teachers. Then we meet again near the end of term four, to celebrate what we have achieved. It is, perhaps, especially satisfying for leading teachers. Primary leading teachers with full teaching loads have a punishing workload, and sometimes it’s really hard to see the light at the end of the tunnel. (I have 18 classes a week, and I manage the library as well; it’s even harder for leading teachers with a grade.) Nearly all the work we do relies on team work with others, and so we often find it hard to take credit for our leadership. We tend to undersell ourselves and we are usually much too busy to prepare thoroughly for reviews, especially at this time of the year when more and more things pile up to be done. So it is very affirming to meet with other leading teachers who respond to self-deprecating remarks by reminding us about our achievements. There’s always someone who says ‘I haven’t done much this year’ only to be roundly contradicted by colleagues listing work done that was noticed, admired, and appreciated. This is not to say that our work is overlooked or under-appreciated by others. Our Principal and Assistant Principals are generous with praise both public and private, and there is a culture at the school of celebrating school and individual achievements. But there is something very special about celebrating with your peers, and I think that the way we do this at my school is one of the things that makes Mossgiel Park PS a satisfying place to work at. Today I was lucky enough to attend a Policy & Research Forum and hear Professor Stephen Heppell talk about 21st century learning. Lucky, because I suspect that I was one of very few practising classroom teachers at the event. I sat amongst a bunch of principals, and I think that most of the other people there were bureaucrats or consultants. I am lucky that my principal thinks it’s important for teachers to attend things like this. Anyway, it was an inspiring opportunity to listen to a visionary. He began with a proposition: he thinks that something has changed in the world, because everybody wants to learn. I think he’s right. In my 30 years of teaching, we have shifted from a situation where kids couldn’t wait to escape school, to kids who love it, and adults who choose to engage in education in formal and informal ways throughout their lives. Prof Heppell is on a campaign for learning. What’s the most common method of teaching reading? Copying from books or the whiteboard ( 52% . And how do students prefer to learn? These preferences are not just what the kids (predictably) want, there are also all kinds of adult experts who confirm that these methods are the most effective for learning: World Bank recommendations, the Head Honcho of Education in Britain, Corporate types and so on. We know this already. We’ve included some of these ideas in charters over the years, and Web 2.0 is in our new strategic plan because our in-school research showed us that the kids are way ahead of us with IT. But, system-wide? It’s all so slow to change! Already knowledge industries surpass manufacturing in the US, and if it isn’t the same here in Oz, it ought to be. Exporting things in expensive carbon-emitting ships is not the way for our country to prosper in the 21st century: we should be selling ideas and innovations on the net. I also like Prof Heppell’s insistence that assessment practices in Oz should not follow the mistakes made in Britain. Teaching kids to regurgitate knowledge they’ve ‘already met’ is silly when what we really want from our education system is to teach our kids to be able to respond to situations they’ve never met before. And lest we felt gloomy about how far we have to go, he reminded us that we are very lucky here in Australia. We have a culture of literacy here in Melbourne (We’re a City of Literature after all!) and we have the potential to be world leaders in education. What would be my measure of success for an education system of the 21st century? A huge increase in the number of bright and brilliant young people wanting to take up teaching as a profession and join in the adventure. 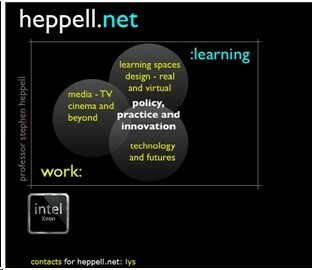 Recommended sites to visit are ThinkQuest, NotSchool, Teachers TV and Prof Heppell’s own sites: Heppell and CEMP.